It’s so important to share the foundational truths of God’s Word with today’s children. God: The Creator King is a six-lesson series that focuses on the beginnings of the Earth and the God who brought it to existence. Children will learn about the Bible as God’s message to all people, how they can know God their Creator, what Jesus did to save them and what role the Holy Spirit can have in their lives. Revised flashcard visuals and text includes new lesson on Jeremiah and Baruch. Resource packs provide many tools to enhance and extend your teaching time. An easy-to-follow guide explains when to use each item. 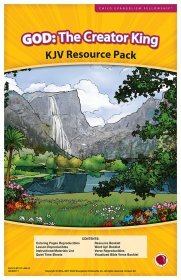 11" x 17" full-color resources: memory verse visuals, Word-Up (main truth of the lesson), resource booklet (review games and activities), UPS Rules. 8 1/2" x 11" back/white lesson reproducibles: coloring sheets, memory verse bookmarks, interactive and review games, Wonder Time. 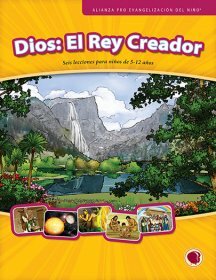 Spanish lesson text for six lessons for the God: the Creator King series. Text includes lesson outlines, detailed story line, review questions, memory verse teaching and more. Lesson text for six lessons for the God: the Creator King series. Text includes a master planning chart, schedule, lesson overview and outline, detailed story line, review questions, memory verse teaching and more! Revised 2017 text includes new lesson on Jeremiah and Baruch. View demonstration of complete lesson, music and more. 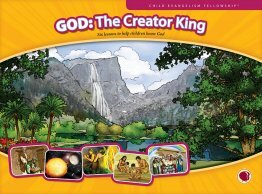 Children will learn about God the Creator through six lessons that contrast God's perfect, original world and how the world continues to spiral downward (the Bible, creation, sin in the garden, the first murder, the flood). Revised 2017 visuals include new lesson on Jeremiah and Baruch. Resource packs are available to enhance your teaching. Includes verse visuals, word ups, reproducibles, coloring sheets and more. Disc 1: Series overview, counseling and complete Bible lesson demonstrations. Disc 2: Full demonstrations of all songs suggested in the series: He Is God, Jesus Is the Good News, Salvation Poem, Three Questions, Ephesians 2:8-9 (By Grace), Genesis 1:1 (In the Beginning), Isaiah 40:8 (The Grass Withers). PowerPoint visuals to teach six lessons for God: The Creator King series. PPT visuals include flashcard visuals, Word Up, memory verses and suggested visualized songs. PDFs of lesson text, verse visuals, reproducibles (bookmarks, coloring /quiet time sheets), Word Up, resource booklet, preschool helps and more. 8 1/2" x 11" back/white reproducibles: coloring sheets, memory verse bookmarks, Quiet Time sheets, skit, decoration, Gospel Spotlights, interactive and review games, Growth Activities, Wonder Time. Download this free sample lesson from God: The Creator King series. PowerPoint visuals and lesson text included for Lesson 2. Purchase all six lessons here! 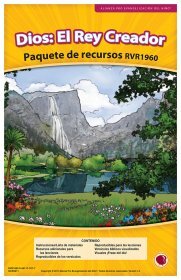 © 1997 - 2019 CEF Press. All rights reserved.